The Mt. 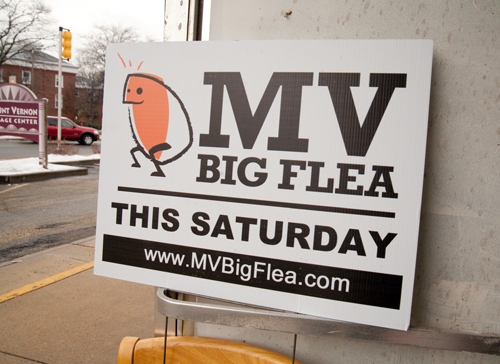 Vernon Big Flea is a huge fundraiser that benefits the Mt. Vernon Community School PTA located in Del Ray. The MV Big Flea takes place in May, but work is well underway to ensure a successful event, including a Shop ‘N Drop last weekend. Like the name suggests, anyone can come to the Shop ‘N Drop to purchase items already donated or to drop off household items for sale. Last weekend, Leslie and I volunteered at the Shop ‘N Drop, helping to unload and sort merchandise. And, as an added bonus, it gave us the opportunity to get a sneak peek at the bargains — and you know we love a good bargain. With treasures behind each corner, I think we only saw about half of the merchandise. But as we dug through boxes and bags, a few things caught our eyes. We weren’t really sure what this was, but think it could possibly be a wall hook for a quilt or tapestry. I imagine it hanging in a long hallway with a fresh coat of paint and additional decorative knobs for hats, bags, coats, and other outdoor accessories. There were a pile of these random items — perhaps part of a shelf or table? 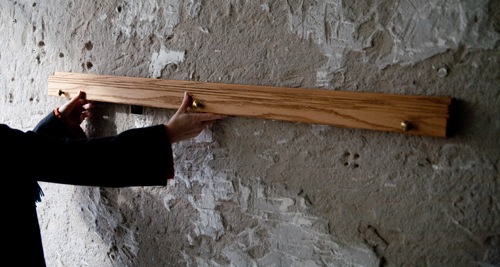 When we turned them around, they seemed to resemble wall-mounted message boards. 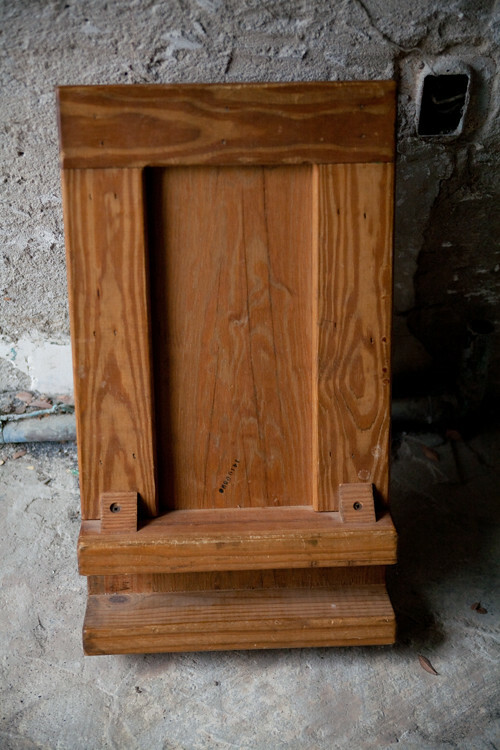 After a nice coat of paint, the recessed part could be filled with cork, a mirror, or chalkboard paint. Key hooks could be added to the bottom and the little slot would make an ideal shelf for cell phones, message pads, or sunglasses. Whoever purchases this will also get a piece of Alexandria history — it’s a CD shelf from the old Olsson’s Books and Records store in Old Town. One of our fellow volunteers used to work at Olsson’s and acquired it when they went out of business. 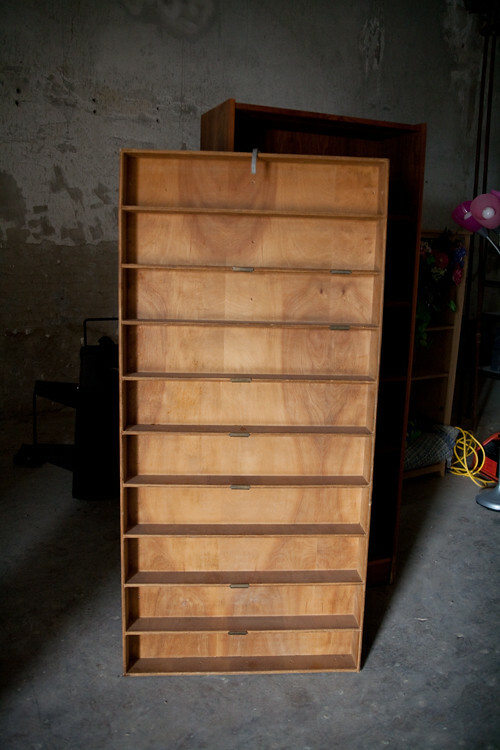 Its narrow shelves are great for CDs, DVDs, paperbacks, and kids’ board boards. And if you have a spot in your basement, use it to store canned goods, spice jars, or other dried kitchen staples. Look closely and you’ll see the metal label brackets still intact. 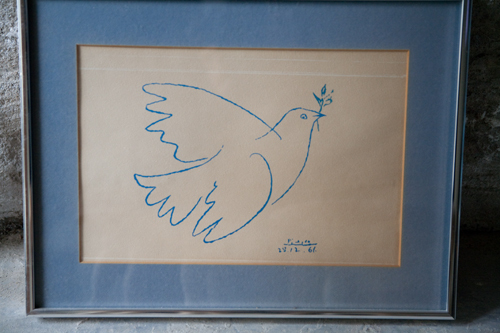 This Picasso print would be darling in a little girls’ room (perhaps with a new mat and frame). We regretfully had to leave this behind, but hope she finds a good home soon. 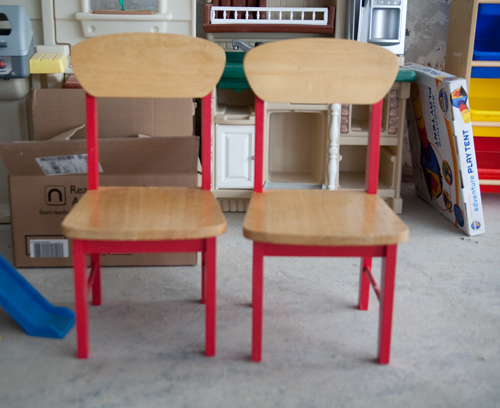 If I didn’t already have enough munchkin chairs in my house, I would gladly purchase these. No modifications needed — their vintage charm is as cute as can be. 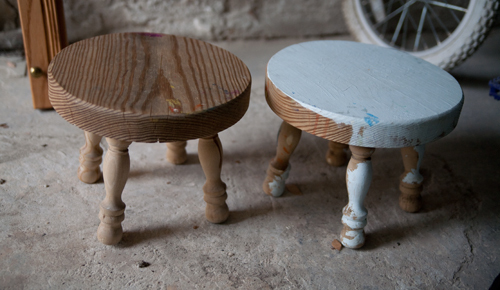 Another gem: these matching stools. One’s already been partially painted, but after some freshening up, they’d be perfect for tea parties, an outdoor picnic table, or in a kids’ art studio. 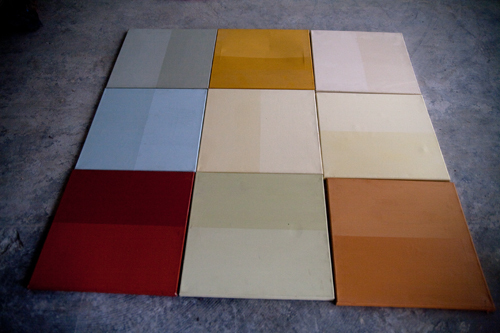 And speaking of art, these painted canvasses were one of several items donated by the former Bungalow Homewares store in Del Ray. In the store, they showcased Bungalow’s paint colors, but anyone could take them, paint over, or wrap in decorative fabric for inexpensive wall decor. Leslie and I stared at them for quite a while and finally came to the agreement one of us just had to get them. Leslie ended up buying them for her daughters — I can’t wait to see what they do with them. But don’t worry, there’s plenty more bargains and DIY inspiration in store. The next Shop ‘N Drop will take place on February 25, 2012. It will all lead up to the main event — the HUGE flea market spectacular — on May 5, 2012. For details, visit the Mt. Vernon Big Flea website. Whether you want to shop or drop, we hope to see you there! 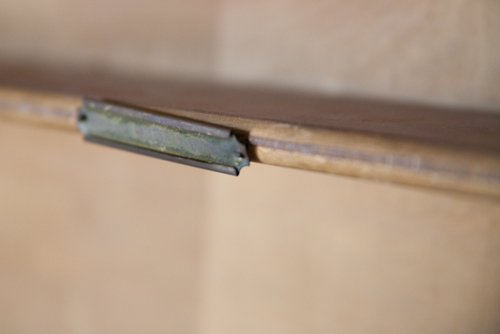 Btw, that wooden thing that is shown with suggestion to turn it into a key rack…. It fits on a Cargo Furniture couch (or table or bed) for holding that cup of tea, coffee, remote, book, reading glasses, etc. Ah of course! Thanks for solving this mystery! Cool chairs! I never see anything good at any sales. Nuts. The mysterious wooden rack item? For mounting a quilt on the wall. great — thanks! that’s what we were thinking too.